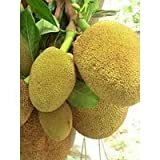 Jackfruit tree growing tree of the genus Artocarpus also known as Jack tree, Jackfruit tree perennial evergreen plant, grows in tropics, subtropical, mediterranean climate and growing in hardiness zone 10b+. Flowers looks like small fruits there are separate female and male flowers, the female bigger and lighter green to yellow, and mostly grown before the male. Fruit color is green to yellow on the fruit there is spines, fruit weight 3-40 Kg (can be more) the size 15-50 cm. the fruits have bad fragrant and not recommend to touch them in the hand, to know when to pick up the fruit need to check that the spines get out easily by touch. When does Jack tree bloom? What can be done with big quantities of Jack fruit? How long does it take for a Jack to bear fruit?